With the spike in numbers of refugees and other immigrants arriving in Europe in the past two years, many Schengen countries have rushed to control the flow of people by using these special temporary border controls. 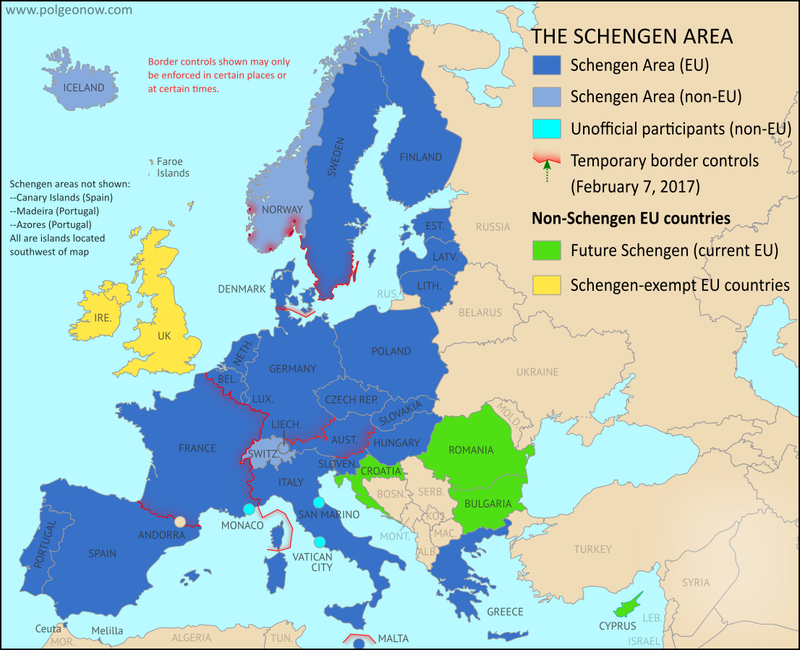 When we published our previous map of temporary Schengen border controls in August of last year, there were six countries policing their borders with fellow Schengen members. At the moment there are seven, but the situation has largely remained the same since last summer. It's important to note that the border controls shown on the map above are the maximum possible under each country's declaration - in some cases actual controls may be limited to only certain parts of these borders, or to certain times. Unlike most of the countries with temporary border checks, which have focused their controls on specific stretches of borders popular with refugees and other migrants, France has reserved the right to maintain controls on all its borders - except, presumably, the boundary with tiny Monaco, which for immigration-control purposes is already treated as if it were within France. Dec. 14, 2015 6 months, 12 days "emergency state as introduced further to Paris attacks"
July 26, 2016 6 months "emergency state as introduced further to Nice attack"
January 27, 2017 5 months, 18 days "persistent terrorist threat"
The most recent extension, declared on the 27th of last month, had the most generic justification yet, and came as France's front-running presidential candidate promised to "ignore" the Schengen agreement and re-institute permanent border checks if he's elected this May. Germany agreed to control only its border with Austria, ruling out border controls with Switzerland, the Czech Republic, Luxembourg, Belgium, the Netherlands, and Denmark. Austria agreed to control only its borders with Slovenia and Hungary, ruling out border controls with Italy, Switzerland, Liechtenstein, the Czech Republic, and Slovakia. Denmark agreed to control only its border with Germany (including land crossings and ferry connections), ruling out border control for arrivals from Sweden or Norway. Sweden agreed to control only crossings over the bridge from Denmark and sea arrivals along its western and southern coastline, ruling out controls for land borders with Norway and Finland or arrivals by sea along its east-central and northern coasts. Norway agreed to control only arrivals in ports with ferry connections to Sweden, Denmark, and Germany, ruling out controls along its land borders with Sweden and Finland. These border controls, originally set to expire in November, were extended another three months, and now expire on February 11-12. 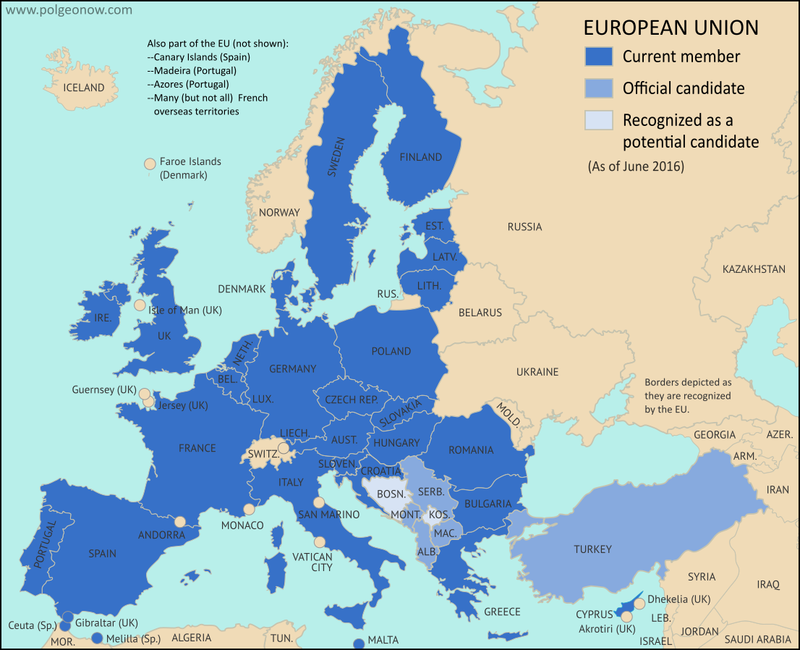 However, EU leaders appear to have approved yet another three month extension, to May 2017, and Germany's government is talking about switching to France-style anti-terrorism controls. Besides those same six countries, border controls are also in place right now for the tiny island country of Malta. However, Malta's border checks are truly temporary, and are only scheduled for January 21 to February 9, as a security precaution while the country is hosting two important political summits related to migration into Europe.